It’s only three days until the West Barns Parent Council Quiz Night. If you are still interested in bringing a team along, please get in touch to get your tickets. 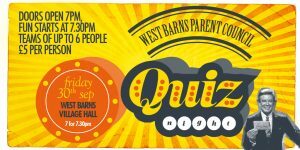 The fun happens on Friday at West Barns Village Hall. Doors open at 7pm with the quizzing starting at 7.30pm. Visit our Facebook page @WestBarnsParentCouncil to order tickets. Spooky activity alert – the Halloween Party is just around the corner! WBPC will again be hosting its hairy scary Halloween Party. This year’s party will be held on Friday 28th October at 6pm in West Barns Village Hall. Keep your eyes peeled for more information on the ghostly goings on! To celebrate what would have been Roald Dahl’s 100th birthday, the Parent Council will be hosting an Afternoon Tea on Thursday 15th September, full of fun and tasty treats, inspired by the great man’s most famous characters! There will be George’s Marvellous Medicine, Oompa Loompa kebabs, Twits bearded crispie cakes and whole host of other goodie on offer. Children are encouraged to dress up as their favourite Roald Dahl character. At our AGM last week, we said goodbye to some old members, welcomed some new and saw a new set of office bearers elected to West Barns Parent Council. For more details on our membership and office bearers, click on the Getting Involved with the Parent Council link above. Back by popular demand! It’s just over two weeks until the second annual WBPC Quiz Night. It all happens on Friday 30th September, doors open at 7pm and the quiz starts at 7.30pm. Visit our Facebook page for more details on how to get tickets. Don’t delay….they are selling fast!